Search for Listings of Real Estate For Sale from 2 MLS's in many languages - Greater Tyler MLS and Northeast Texas Real Estate Systems (NTREIS). CLEMENTS, REALTORS® is a full service real estate company located in Winnsboro, Texas. We strive to... provide quality service and dependability in all areas of real estate. Our office is staffed with dedicated, knowledgeable and honest real estate agents who work with buyers, sellers and investors in real estate transactions spanning all price ranges and property types. We are committed to providing courteous, personal and professional real estate services to our customers and clients. Our goal is to help make your real estate experience as happy and stress free as possible as we help you find the property of your dreams. We work to understand your concerns and want this to be a pleasant and rewarding process for you. We take pride in treating every customer honest and fair, and treating each listing as if it were our very own. Give us a chance to help you with your every real estate need! 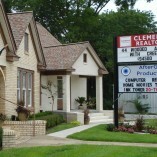 Clements Realtors offers a professional service. Clements Realtors finds creative solutions. We had the most AMAZING experience with Clements Realtors! They absolutely went above and beyond to help us buy our house and made the whole process an enjoyable experience! Cabin for sale has special circumstances which agent is very familiar with. Marketing focus is on point and I hope the future buyer will find the cabin perfect for his dream. Great place to purchase house or land super friendly helpful people there . My realtor Mrs. Debra Evans was outstanding. As a first time home buyer I was extremely apprehensive of the whole process, but not only did she find the perfect home her customer service skills were above and beyond! Five stars all around experience! Linda Elliott has helped us greatly with some property we inherited. She has offered advice and guidance and has been with us every step of the way. She is readily available and responds via text, email or phone promptly. Linda is very knowledgeable about the real estate business and is an assset to your company. We would highly recommend her to anyone looking for property in the area. Quick responses and excellent problem solving skills. Works well with other agencies and always has their clients best interest at heart. Would definately use this agency again! Our realtor, Anna White, was excellent in all regards. She showed us many, many houses and was always happy to do so. You could tell that she really wanted to help us find the right house for us. We appreciated all she did for us and would highly recommend her to anyone looking to buy a house. Anna white was amazing! She was patient, helpful, and truthful. And besides that we became church family!!! Anna White was really helpful , quick response to our questions . Thank you ! I appreciated the agent Stephen Parrish. I felt he went way beyond the responsibilities of an agent. He was very thoughtful and kind. always responded to my questions, helped me by giving his advice and knowledge. always kept an eye on my property when I was not able to. I would recommend Clements Realtors and Mr Parrish for the sale of your property. Anna White is courteous, knowledgeable and professional. She always responded to questions or concerns with wisdom and excellent advice. Recommend without reservation. They do everything they can to sell my houses & did. I would certainly recommend Clements. The service was exceptional!! The customer is #1 at Clements. Small town agency that gets the job done from start to finish.